I am very pleased to share that, finally, the Safe routes to School grants and the Smart Transportation PCTI grants were awarded today in PA.
A total of $16.8 million was awarded to create Safe Routes to School– which is about 80% of PA’s overall SRTS funds. Congratulations Pennsylvania! Still -- there is much work to do in Berks County. HARRISBURG – Pennsylvania will create green jobs, relieve traffic congestion and make it easier for students to walk and bike to school with the investment of $76 million in 80 transportation projects, Governor Edward G. Rendell announced today. “PennDOT’s investments will help us weather the current economic storm and make lasting community improvements for future generations,” Governor Rendell said. “These investments will stimulate the economy by putting people to work creating sustainable communities that will improve our quality of life and send a clear message that Pennsylvania is a great place to live and work. The Department of Transportation is providing $59.2 million for 50 Smart Transportation-related projects and $16.8 million for 30 Safe Routes to School projects that will improve safety and encourage walking and biking-friendly improvements. Click here read the full release! Academy of Pediatrics says how we build is bad for our kids! FIGURE 1 Comparison of street networks and land use in sprawled (upper) and traditional (lower) neighborhoods. Source: Drawing by Duany Plater Zyberk as shown in Spielberg F. The traditional neighborhood development: how will traffic engineers respond? ITE J. 1989;59:17. Today, the American Academy of Pediatrics adopted a ground-breaking policy statement on the link between how we build communities and the health of the children in those communities. "The current approach to development isn't good for kids." Richard Jackson, Professor and Chair, Environmental Health Sciences UCLA School of Public Health, says. "A child's life is affected by the environment in which he or she lives. Relationships between health and the quality of air, water, and food are well recognized.1–3 The physical environments of the home and school also influence health through exposures to lead,4 mold,5 noise,6 or ambient light.7 In addition, the overall structure of the physical environment of a child's community (referred to as the "built environment") can also affect health in diverse ways. As cities have expanded into rural areas, large tracts of land have been frequently transformed into low-density developments in a "leapfrog" manner. The resultant urban sprawl can increase automobile travel, which increases air pollution8 as well as passenger and pedestrian traffic fatalities.9 Some urban areas may have few supermarkets, produce stands, or community gardens, thereby limiting access to fresh fruits and vegetables.10 The physical environment of a community can support opportunities for play, an essential component of child development,11 and for physical activity, a health behavior that not only reduces risk of excess weight gain12,13 but also has many other benefits for overall well-being. " Thank you Heidi, for your contribution and bringing our attention to this excellent research! Begin planning now for the October 7, 2009 International Walk to School Event! International Walk to School Day or IWALK is a day which promotes the health of kids, making great green choices, and provides safer routes for walking and bicycling. Involve your APT, PTO or other parent teacher organizations. You can expect to get every student in the school involved, even those that ride a bus. Based on the International IWALK site, www.iwalktoschool.org. IWALK started in 1994 in Great Britain, and as of 2007 was in 40 countries. IWALK is a great idea, as it promotes exercise, teaches that walking a few blocks is OK, and if we walk, we're not polluting the neighborhood with our cars. Something great happens to a community that walks to school, you actually get to talk to your neighbor and share common experiences, or ask about the street light that is no longer working. Any way you slice it, IWALK is good for you, your community, and your environment. Click here to read the full source. Los programas de rutas escolares seguras (Safe Routes to School, SRTS) aplican un enfoque global para que las rutas escolares sean seguras para el desplazamiento de estudiantes a pie o en bicicleta. Los líderes de la comunidad, los padres y las escuelas están poniendo en práctica estos programas para mejorar la vida de los estudiantes poco a poco. There are still 10 days left in May to celebrate the bicycle as a means of transportation to your place of work for Bike To Work month! Bike To Work day showed that commuters all across the country have decided and continue to decide that the bicycle is a great choice in your alternate transportation needs. What are you doing to promote the bicycle at your place of business? You still have time to get your fellow employees and employer to participate in our Bike To Work contest where you could be the winner of $200 off a new bicycle! See previous post for details at the below link and access to tracking reports on your commute for the contest through our yahoogroups link. You must sign up for our yahoogroups listserve to access. Join employers across the county such as Baldwin, Berks County, the City of Reading, Sovereign and Best Buy where employees are commuting to work by bicycle. Team up with fellow employees to get the most employees participating and increase your chances of winning the contest! 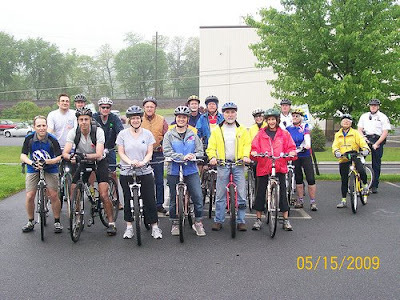 This picture and more than 200 others from across Pennsylvania can be found on Bike to Work Pennsylvania. "Since I'm riding my bike to work now does that mean I have to start wearing those shoes that clap really loud on the pavement, start wearing tight fitting clothing, cruising the internet for anything biking related and become a Lance Armstrong fan??" 1 - Shoes - Bicycle specific shoes are desirable as they have harder soles that don't flex as much as your sneakers or shoes you walk in. They help transfer more of your energy into the pedal and minimize wasted energy. There are however a wide assortment of cycling pedals and shoes that are comfortable to walk in when not on the bike so all is not lost. But, a pair of your comfortable sneakers will work just fine as well. 2 - Pants - Cycling specific shorts are form fitting and come with padding called "chamois" that helps reduce the chaffing between your thighs. There are cycling commuter shorts or knickers you can buy that look just like regular shorts but come with chamois sewn on the inside. You will find these rather comfortable on the bike and off the bike. But, don't let that stop you from wearing a regular pair of comfortable shorts. If you do wear long pants don't forget to strap something around your right pant leg so it does not get stuck in your chain! 3 - Shirt - Cycling jerseys are form fitting, breathable and come with nifty pockets on the back to store things. Commuter jerseys are more of a relaxed fit but still breathable and may come with pockets in the back or side. You'll find that commuter jerseys look almost like any shirt you might wear to relax in. Again, this is based on preference but you could wear your favorite non-cycling related shirt as well. Just be aware that cycling specific shirts are longer in the back so when you are bent over on the bike you won't have a "bare" spot bearing for all to see. 4 - Gloves - What's the deal with gloves that don't have fingers? Well, cycling gloves have padding that help absorb the shock from bumps in the road or trail. Also, did your mother ever tell you not to wipe your nose on your sleeve? Well, she never mentioned anything about gloves! Let's face it sometimes when riding in the cold your nose well get a little runny. Better to wipe on your gloves then your bare hand. 5 - Sunglasses - Do you wear sunglasses while walking outside on a bright sunny day? Then you'll appreciate a good pair of cycling shades as well. Their purpose is to keep out ultraviolet rays so you can see better but also to protect your eyes from the wind and debris that flies around the air while riding. Make sure you get a pair that wraps around enough so the wind doesn't come in through the side. Are these necessary? No. . . but they do look cool! And uh. . . are functional as well! 6 - Helmet - "My hair will get flat if I where a helmet!" You'll likely hear different opinions on the use of helmets but one thing is for sure is that wearing a helmet will protect your head and could save your life in the event you ever crash. So, why take chances? Plus, they help make you more visible if you have a colorful one. Now, what to do about your hair. This is one area where you may want to consider a new look. Shorter hair styles don't need to be maintained as much and don't lend themselves to "helmet hair". However, there are many bicycle commuters who have long, flowing, curly hair and have learned a few tricks. You can tie your hair up into a pony tail and let it go out through one of the air vents of your helmet. Or you might consider pinning the top of your hair. With all the hair gels and styling cremes we have today you can certainly get your hair stylin again when you get to the office if you need it. Do you remember having to wear all this stuff when you were a kid riding your bike? Probably not. So, don't let that stop you now (with the exception of a helmet). Just know that there are more comfortable and functional cycling clothing out there should you decide your current wardrobe isn't cutting it. Don't forget the competition WalkBikeBerks is promoting for Bike To Work month thanks to the generous donation of Spokes Bike Shop. You could win up to a $200 off the purchase of any in-stock bicycle, a Spokes team jersey, or $50 toward any in-stock merchandise. To help you keep track of your mileage and trips please reference the links below that you can print out or have your employer fill out to track total employee participation. These files are only available to WalkBikeBerks members who have signed up to our Yahoo listserve. If you haven't already signed up, please click on the link below to sign up for our Yahoo Groups listserve! Wednesday, May 13, 2009 at 7:45 a.m.
Mount Penn, PA – Mount Penn Elementary School and WalkBikeBerks will wrap up their first Safe Routes to School Program year with a Walking School Bus Celebration on Wednesday, May 13, 2009. Mount Penn Elementary Center was one of five Pennsylvania Schools awarded $5,000 through a Pennsylvania Advocates and Nutrition [PANA] Safe Routes to School Academy Mini Grant. The purpose of the mini-grant award is to educate and encourage students to walk to school during a two-year program. More than 400 students are invited to walk to school along with parents, teachers and community leaders. Commissioner Barnhardt, Commissioner Leinbach, Mayor Nowotarski, Chief of Police Anthony Garipoli, Sr., Superintendent Dr. Mayes, Principal Hoffman, Executive Board Members of WalkBikeBerks, and the Excellent Teaching Staff of the Elementary Center have committed to walking with us. The event will begin at 7:45 a.m. with kids, parents and community leaders walking from two destinations in the community: Redner’s Warehouse Markets and Lutz Funeral Home. Walkers will arrive at the school by 8:30. 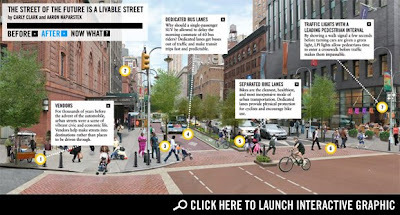 The event is being organized with WalkBikeBerks. WalkBikeBerks works to promote Safe Routes to School and Complete Streets county-wide. We would like to see every child in Berks County have the chance to safely walk or bicycle to school. Please join us as we make walking and bicycling practical, convenient, and safe in Berks County, Pennsylvania. A Walking School Bus is simple to begin. Pick a single neighborhood that has a group of parents and children who are interested. Invite families who live nearby to participate. Pick a route and take a test walk. Decide how often the group will walk together. Have fun! A good time to begin is during International Walk to School Week on October 7, 2009 – International Walk to School Day in the USA! Walk and look for ways to encourage more children and families to be involved. Organize your Safe Routes to School Team today! WalkBikeBerks is eager to help you. Just ask! For more information, contact Michele Barrett, President of WalkBikeBerks at mbarrett@walkbikeberks.org or visit PANA’s Safe Routes to School Academy Web site at http://www.srtsacademy.org/. "I can't ride to work. I get to sweaty!" Okay, if you're going to let a little thing like sweat get in the way of riding your bike to work then you might as well stay home and start watching your video of Sweatin' to the Oldies! There's no way around sweat. The average person has over 2.6 million sweat glands. With all those glands something is bound to seep out. So, what should you do so you don't have to walk around the office all day with dry sweat all over your body and smelling well. . . kind of sweaty? 1 - If you use your commute as part of your exercise or training program use the ride into work as just a warm up. Keep your legs spinning but don't push yourself too hard. Just spin enough to get the blood circulating and heart beating. If you have a longer commute do a couple of hard efforts but use the last couple miles to cool down. Use your ride home for the hard efforts and even put in a few extra miles if you like. 2 - Remember, sweat occurs when you work your muscles and they need to cool off. Sweating is actually a good thing when it comes to exercise performance. However, to minimize sweat on the commute keep in mind you want to wear breathable fabrics. Otherwise, the heat builds up and has no where to escape. Also, remember to have your commuting attire washed regularly. Starting the day off with sweaty clothing isn't good for anyone. 3 - When you arrive at the office you'll need a couple things either stashed at the office or you'll need to have them with you in the backpack you brought with you or a messenger bag. a. If your company has showers to use this is the easiest answer to your problem. Hit the showers and start the day feeling nice and refreshed! b. If you work nearby an exercise facility see if your employer can work out an arrangement where you can use their showers. c. If you don't have showers at your place of business start with a towel. Start by drying the sweat off your body. Remember, to toss your towel in the laundry after a couple uses! d. Baby Wipes - They're not just for babies anymore! Use them to wipe yourself down after toweling off. They're good at getting sweat off your body and will help cool you down as well. Plus, you'll have the added bonus of smelling better then a clean baby's bottom! Actually, many commuters use them and rarely have been accused of smelling like a baby. e. Deodorant or Antiperspirants - Use your favorite to keep yourself smelling like someone with whom your coworkers and customers want to do business with. Apply in all the usual places. The lower part of your back gets sweaty too so go ahead and apply some there as well if you like. Or, go the old fashion route and use some baby powder which is just as effective at eliminating odor and keeping yourself sweat free! So, there you have it. Don't let sweat imprison you. Be released with the knowledge that sweat can't hold you back from enjoying your day at the office when you ride to work! Some folks are already sending in pictures of the day. To be sure we keep them organized in one place for everyone to see and share, please add your pictures to our Flickr Group created by John Boyle. Anyone can upload photos to this group: http://www.flickr.com/groups/pabikesummit/. The single most important action that you can take now is to contact your legislator and encourage them to support HB1110 or SB776. 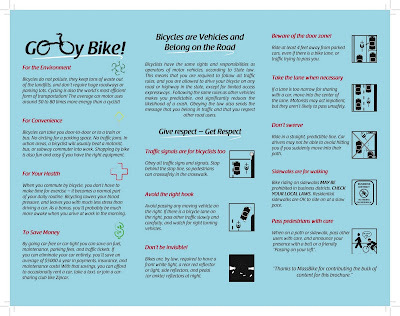 You may also considering supporting HB1109, a harassment bill meant to protect cyclists from "bullies" on the roadways. An email, phone call or brief letter will only take a moment of your time, but is vitally important to the success of these laws. Bike to Work month is here. . . and it's all wet!! Oh well. . . might as well put the bike away and get in the car. This may be your first thought, but before you get the "Wicked Witch of the East" complex and fear that you'll melt at the slightest drop of rain let's consider what you can do to help prepare yourself to ride in the rain and still have an enjoyable commute without showing up to work all wet! With proper clothing you can ride in just about any weather and still enjoy the ride. If it's raining you'll want to where all-weather clothing. It could be as simple as a parka or a cycling specific rain jacket. You'll want something that is breathable but will keep the rain off. If you don't have a change of clothes with you or at the office you'll also want to wear some rain paints to keep dry. Also, wearing cycling gloves comes in handy in wet weather to help you keep your grip on wet handlebars and the brake hoods. In addition to clothing you may also want to have fenders attached to your bike. They will help keep the water runoff from spraying your backside and bottom. And don't forget your lights. Rain is usually accompanied by dark clouds so be sure you can be seen if riding in traffic. Be sure to check your local weather for the hour by hour forecast on a website such as weather.com. It will show you the % chance of rain throughout each hour of the day. Maybe you don't mind riding home in the rain but would prefer not to on the way to work. An hourly forecast will help you with that decision. Another alternative to riding to work in the rain is to arrange a trip with BARTA which now has bike racks on select routes in Reading. You can put your bike on the rack for the ride to work and then ride it home at the end of the work day. Be sure to check with BARTA on availability. If BARTA is not an option put the bike on your own rack and take the car to work. Leave the car at work at the end of the day and ride home. The next day ride your bike to work or take public transportation. Last but not least be sure to pack a small towel in your cycling bag or stash one at the office to help you dry off if you do get wet. So there you have it. If you're prepared for the weather you may just end up Singing in the Rain instead of Singing the Blues! No Bike? No Problem! Join us on the Capitol Stairs for the Rally. Bike To Work month is here! Be sure to celebrate the invention of the bicycle and get out and ride it to work this month! As a recent commuter of over 1 year I'm very aware of all the excuses we give for not riding our bike to work. "Its too far for me to ride"
"My hair would get messed up wearing a helmet"
Now's the time to confront your excuses and as the Nike slogan goes "Just Do It!" Throughout the month I'll be sending out some tips to help you in your commute. Here's the first. . . "Just Do It!". Let's leave the excuses behind and do what we know will be a healthy alternative to sitting in your car. In a recent exchange of words between Tour de France legend Lance Armstrong and Levi Leipheimer during a recent race, Lance somes it up best. Levi had asked Lance if he should go for the win and Lance's reply was. . "You know what. . . you're a winner so go win the stage and we'll figure the rest out later!" So there you have it. To help you figure it out stay tuned in the coming days for more tips!